After watching David Douglas and Drew Fellman’s visually spectacular, technically amazing, and occasionally cutesy documentary, “Pandas,” you’d think that IMAX 3-D was invented solely for close-ups of adorable panda cubs, their giant doleful, domino faces peering out with cuddly curiosity. These are the inhabitants of the Chengdu Research Base for Giant Panda Breeding (Chengdu Panda Base for short), in China, where Hou Rong , the director of research (known also as “Panda Mom”) has been steadily building the population of the endangered species. At the facility, lab-coated workers pamper the cubs, bottle feed them, teach them to climb trees, and engage in rough-housing play (one thing you learn about baby pandas is that they really enjoy being rolled around like big furry hedgehogs). But it isn’t all fun and games. When they have grown into adults some of the pandas must relocate to the remote, mountainous areas where the species has fled the encroachment of civilization to revitalize the species. These pandas have been born to parents who themselves have only known a captive environment, and therefore couldn’t instruct the cubs in the skills they will need to survive in their natural habitat. Luckily, avuncular New Hampshire resident Ben Kilham, a.k.a. “Papa Bear,” has been adopting orphaned black bear cubs for years and has learned how to become a surrogate parent and instruct his charges in the ways of the wild. He tutors the somewhat skeptical Hou Rong and her assistants in his methods, and their first candidate to take the big step is roly-poly Qian Qian (pronounced Chen Chen ). She becomes the film’s anthropomorphic heroine, as she steps out of the sheltered preserve and begins her pioneering, risky adventure. 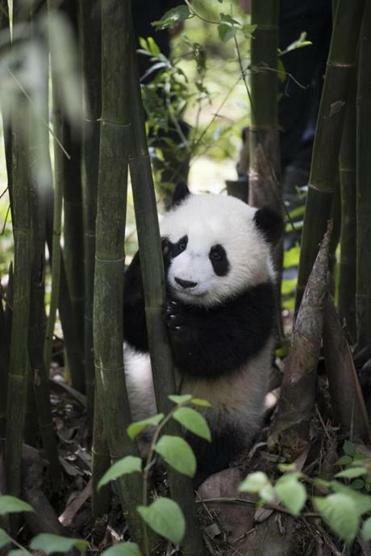 As photogenic as the pandas are, the Chinese landscape — eldritch mountain ranges and lush, shaded forests — rival them for the viewer’s attention. Every image is lovely, and even when the point being illustrated is human incursion into the environment, Douglas and Fellman show the Leshan Giant Buddha , a 233-foot-tall 8th-century statue carved into a cliff, rather than, say, polluted rivers or strip mining. Even the mosquitoes swarming the New Hampshire woods are magical — you might be swatting at them as they seem to come buzzing off the screen into your face. Despite such G-rated Nietzschean clichés, “Pandas” does its subject justice and is a reminder of the importance of protecting endangered species and preserving the environment when these values have fallen from official favor. Directed by David Douglas and Drew Fellman. Written by Fellman. At Simons IMAX Theatre at the New England Aquarium, Jordan’s Furniture IMAX in Natick and Reading, and Cinemagic Hooksett & IMAX. 42 minutes. Rated G.